« Reminder: design us a new banner and win Sailor Jerry gear! I was trawling through some old pics and thought I’d share this. 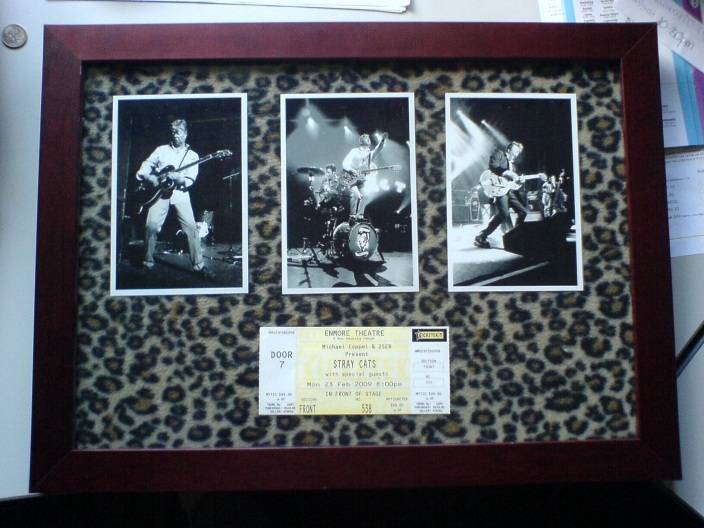 This is a memento of the Aussie Stray Cats tour from a couple of years ago. The pics are just from a camera phone, they’re not great quality but they’re reasonable. I was able to make them a lot cooler by converting them to black and white and bumping up the contrast a touch. The ticket stub is pretty self explanatory, and the cloth trim is just some stuff from Lyncraft. The frame is just from one of those discount stores that sell excess stock. Hardest part was measuring it out so it was all even and straight! Now if you’re after some cheap wall art there’s no reason you couldn’t steal this concept and create something for yourself. I’ve got a similar piece with a Trader Vics theme with a business card, napkin and a menu (which a mate brought me back from the States). There are heaps of things you could use as a basis for your own art, be it old postcards from a vintage store or even pics from a magazine. Better yet, you don’t need to be a budding Shag or Keith Weesner to create something original and half decent! Looks great! Maybe I could do something similar with my Mercury glovebox that they all signed on one of their tours years ago.